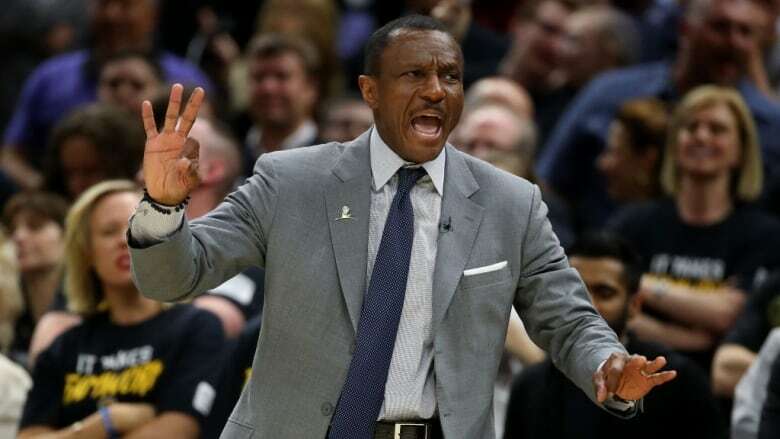 Less than a week after being fired by the Toronto Raptors, Dwane Casey was named a finalist for NBA's Coach of the Year. The 61-year-old was the most successful coach in Raptors history, and Toronto rewrote the franchise record book this past regular-season, winning 59 games and earning the No. 1 seed in the Eastern Conference for the first time. Toronto general manager Masai Ujiri told Casey his seven-year tenure with the team was over last Friday, which was the price paid for being swept by Cleveland in the second round of the playoffs for the second consecutive season. Utah's Quin Snyder and Boston's Brad Stevens are the other finalists. Houston's James Harden, Cleveland's LeBron James and Anthony Davis of New Orleans are the finalists for the NBA's MVP award. Harden, who led the league in scoring, has twice been a runner-up for the award, including last year when Russell Westbrook won. James has won the MVP award four times. The three finalists for the individual awards were announced Wednesday. The winners will be announced on June 25 in Santa Monica, California during the NBA Awards show. Davis was also a finalist for Defensive Player of the Year, along with Utah's Rudy Gobert and Philadelphia centre Joel Embiid.